Sprint’s turn around strategy — the iPhone + somewhat lower prices — seems to have saved the company from death, but hasn’t proven successful in growing the customer base. However, T-Mobile CEO John Legere’s approach — customer friendly terms, lower prices and, yes, the iPhone — has not only stopped the subscriber number slide, but also lead to an amazing turn around and growth. In the second calendar quarter, T-Mobile added new subscribers, about 688,000 of them. While about one-in-five of those adds bought an iPhone, 79 percent did not. 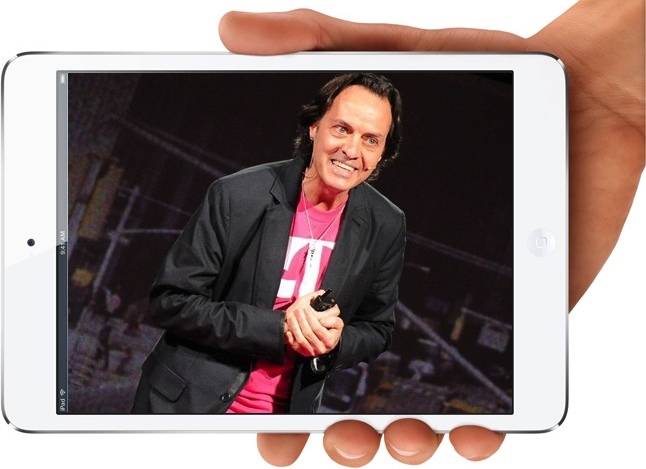 However, CEO Legere is quite happy with that ratio. And, this is the first time in four years that T-Mobile has netted more new subscribers than it lost. In fact, the company’s churn is running at a three-to-two rate, attracting three new subs for every two that leave. To date, T-Mobile has rolled out the uncarrier (contract free service) and Jump (accelerated upgrade plans), which together with the addition of the iPhone to their catalog have fueled growth. However, the CEO said that the third leg of the company’s revitalization is coming this Fall and part of that will be more Apple products. The obvious items here are this Fall’s anticipated iPad 5 and iPad mini 2. Given Apple’s “lack” of LTE-enabled notebooks or iPods, it seems unlikely other Apple products will be part of the mix.